Throughout his career, Darshan Singh Ragi had been singing hymns from the powerful banee of Sri Guru Gobind Singh Sahib. He has also been doing katha from Krishnavtar, Ramavtar, Chandi Charittar and other banees of Guru Sahib. During the political turmoil in Punjab he instilled ‘Bir Rus’ among the Sikh youth by singing the Dasam Banee. Until recently he had been writing essays on the glory of Sri Dasam Granth. But in the last decade Ragi has become a turncoat; not only criticising but using derogatory language for the Banee he once had high respect for. He has even started casting aspersions on Nitnem and Amrit Banees. Not surprisingly he has lost all the hard earned respect of the panth. What has gone into his mind is anyone’s guess. Why cant he continue doing the same gurmat Katha of the Banee is anyone’s guess. ‘Prof’ Darshan Singh Ragi was excommunicated from the Sikh Panth in January 2010 for his blasphemous remarks on the life of Sri Guru Gobind Singh Ji. Throughout his career as a ‘Ragi’ and later the ‘Jathedar’, Darshan Singh had performed keertanand katha from the bani of Dasam Pita. During the turbulent years following Operation Bluestar in 1984, Darshan Singh regularly performed the keertan from the ‘Beer Ras‘ Bani enshrined in Sri Dasam Granth and incited the Sikh youth to take up resistance. However, two decades later, Darshan Singh changed his faith, and not only started opposing the bani of Sri Guru Gobind Singh Sahib, but also used derogatory language for the same bani he once performed keertan and katha of. Till date the turncoat Ragi has not explained to the panth why and how he decided to choose the path of a ‘Guru Dokhi‘. In one of his loose arguments justifying his latest stance he said that earlier when he used to do the keertan of Guru Gobind Singh Sahib’s bani he did not understand the meaning of the bani, and was only doing the keertan as “any other Ragi”, relying only on Amrit Keertan pothi. However, this lie and an absurd excuse is soon exposed when one listens to his earlier recordings where he not only performs keertan but very articulately also does the katha of the bani in the light of Gurmat. 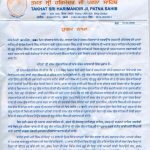 It is quite clear that Darshan Singh was well versed with the actual content and purpose of bani contained in Sri Dasam Granth, which he now shamelessly denies. Now what really has transpired between the turncoat Ragi and his intellect that lead to his own downfall and his ultimate exit from the Sikh fold is anyone’s guess. 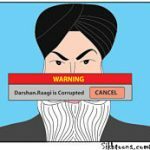 Darshan Singh and been shown the door by the panth. And as expected from the renegade Ragi, he stills continues to create confusion. The panth needs to be vigilant and have the relevant information at their disposal. And this is a similar attempt.